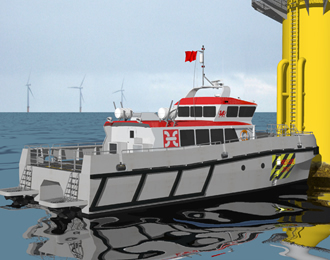 Holyhead Marine is to build a 19m Wind Farm Service Vessel for its sister company Turbine Transfers. The vessel has been designed by BMT Nigel Gee Ltd. The project will benefit from BMT Nigel Gee's considerable design experience in developing high speed catamarans along with Turbine Transfers years of operational expertise, to produce what will be a capable and highly flexible craft. The vessel has been deigned with a multitude of roles in mind, the raised bow platform and tailored bow provide a stable platform for crew transfer with the oversized waterjets giving consistant thrust in the "push up" condition. The vessel is fitted with intergrated flush foundations for a crane and a container on the fore and aft decks. The craft has a generous moonpool in the foredeck with inegrated cable runs for surveying equipment. The aft deck has mounting for a removable A-frame and dive platforms over the waterjets. The accomodation is sound insulated and double glazed and passenger comfort has been placed as a priority. Construction of the vessel is due to start very soon at Holyhead Marine and due to complete in early 2012.